2012 SMS Exhibition "Best in Show" winner. 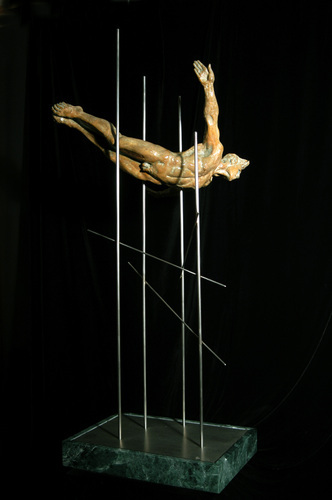 For my second sculpture I chose to render a male figure doing a swan dive in mid-flight. Once I completed the diver, I needed to find a way to support approximately 40 lbs of bronze in the air. This is eventually done with the use of stainless steel rods that pinned into the sculpture. The final application has a simple elegance and weightless quality.